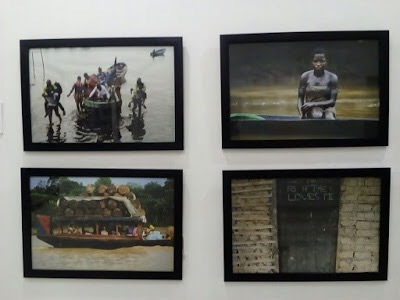 The exhibition, titled “Delta Bush Refineries and Other Stories” by Akintunde Akinleye is a collection of life in the Delta. It shed lights into the activities of the people involved in the vandalization of oil pipeline and asks the fundamental question, ‘why are they doing it? The theory of art as expression seems to be the fundamental concetto of execution in the exhibited works of Akintunde Akinleye. The works clarified and refined the ideas and feelings that are shared with the spectator and bluntly tell them the secrets of their own hearts. He did not set out to criminalize the youths who are engaged in the oil bunkering but to bring Nigeria’s inability to address corruption to the limelight. He is concerned about being socially responsible to tell the stories of burning issues in the country. It is a known fact that Nigeria is endowed with enormous natural resources and crude oil has arguably been a sustaining factor for the country since its discovery in the village of Oloibiri, Bayelsa State in 1956. It has contributed to the development, growth and domestic violence that have left unforgettable scars in the country. Uncountable lives have gone beyond the Aegean in the course of protecting, vandalizing and inoculating crude oil in the country. 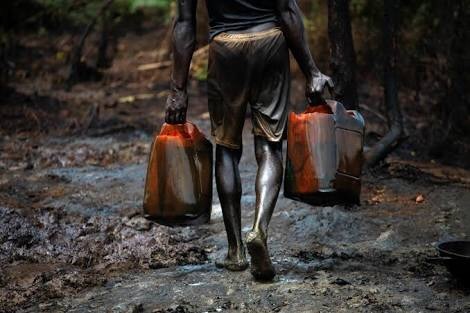 These are the results of the misappropriation of oil proceeds which threatens the country’s peace. 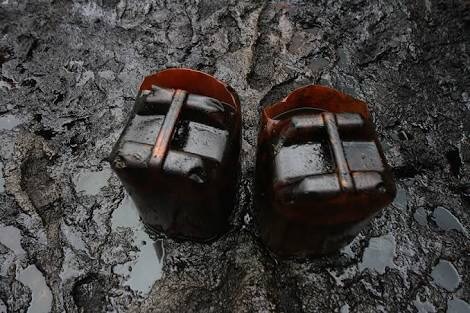 The expectation of the Delta people was raised at the discovery of this rare commodity. They were promised that the region will experience accelerated growth, infrastructural development, and stabilized economy but the reverse is the case as the elites and the political class carts away the proceeds from oil to acquire material assets for themselves at the expense of the nation’s collective development.Ironically, these political class hides under the cloak of unemployed youths to drain the country of her natural wealth. These were captured in the photographs of Akintunde Akinleye. Crude oil, has given the country a stable position in the global scene and the poverty level of the country is still nothing to write home about. How do we classify a country whose policies do not favour the masses?Instead of the country to develop policies that would alleviate the level of poverty in the country, they develop policies that criminalize zealous youths who have neglected their various certificates for menial jobs that sustain them. Akinleye used this arena to penetrate into the oil-infected activities of the Delta and the politics of oil that has expanded the leaking hole of the country’s political bowl. Nevertheless, the country pours more money into the begging bowl which leaks into the confines of the political class and the masses are curious to see the leakages. They want to see facts that challenge cynicism and tell the people what is effective and what is not. Facts like people want to be free and when they are free, liberty is usually around the corner. 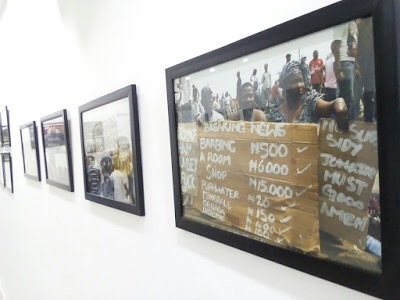 Award winning documentary photographer, Akintunde Akinleye held his exhibition at the Omenka Gallery from the 17th -31st December 2016. It was a platform that generated an ambience for societal reflection and took the audience into a realm that is often intentionally ignored.